Anyone go? Saw this sign down at the bottom of Montecito Drive over the weekend. Was it A Tribe Called Quest? Cypress Hill? Beastie Boys? Wu-Tang? Maybe Too Short? Guess I shoulda waited my 15 minutes and hopped on the shuttle. 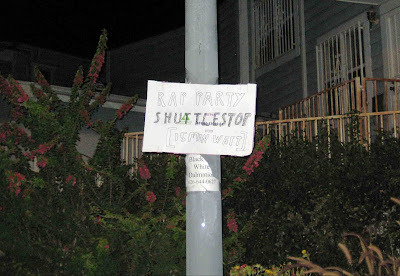 As I understand this, there was a movie filming up on Montecito Dr. near Pagoda Pl., and the sign should have read "wrap" party. The party-goers all valet parked on Montecito near Griffin, and were shuttled up to the function. I don't know of any residents that were invited, other than perhaps those who lived at the house which was utilized. Or so I was told... hope everyone had a fun summer, it's a beautiful Saturday morning in the Heights, I think I'll go on a nice hilly run! Take care, all! And by the way, those three houses in the 900 block of Montecito Dr. are finally coming to a finish. So we won't have to drive through the dirt and dust daily, and I won't have it wafting through my house all the time!